Author: John T. Daugirdas, MD, FACP, FASN, et al. Please note that this course is designed for experienced nephrology nurses, especially those certified in this field. 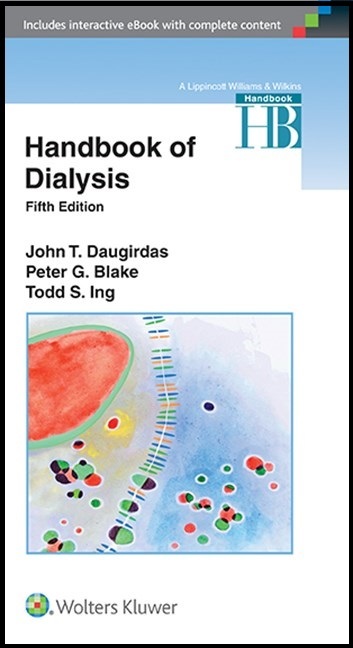 Handbook of Dialysis is the go-to source for current data and recommendations on diagnosis and patient management of all aspects of dialysis therapy. The practical and evidence-based content is authored by international dialysis experts who address a range of topics, including screening predialysis patients and preparing them for renal replacement therapy, how to do hemodialysis and peritoneal dialysis, followed by chapters focusing on problem areas frequently encountered in dialysis patients. This book is ideal for nephrologists faced with the practical issues of providing dialysis care in both acute and chronic settings as well as for nephrology nurses who want a deeper understanding of dialysis procedures and the challenges often encountered in these often difficult to manage patients. The text summarizes new findings and treatment options that have come into use since the last edition. Textbook is very advanced, detailed and technical in nature. A wealth of information and a great reference to have on hand in inpatient dialysis units. This course would not be a good choice for nurses who are new to dialysis. It would probably be overwhelming. Excellent text - will be my "go to" reference for all things renal. The textbook is very good. I wish it was available 20 years ago when I was doing dialysis on critically ill patients. The text was also not an easy read. I genuinely like this text. It is not an easy read, but it is comprehensive. I have some hemodialysis experience, and I feel the textbook would have been wonderful to have as a resource when I was learning. Experience is a good instructor but much slower than a great textbook. I have a new respect for dialysis nurses who require a vast amount of knowledge related to interpretation of labs and what solutions are needed for correction of abnormal. Your book purchase includes an eBook version created for Android, iPad, iPhone, iPod touch, PC, & Mac.